As war continued, tanks were developed so soldiers could travel more easily across the battlefield and not get caught on barbed wire or by gunfire. 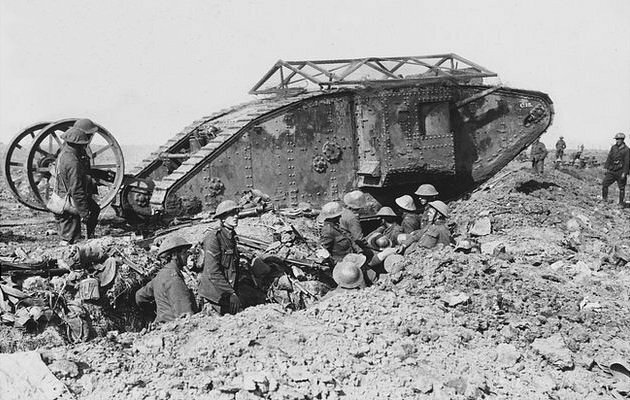 A broken down Mark I tank across a British trench on the way to attack. The mesh on the top was to prevent grenade damage. The wheel at the back was not included on later models. The experimental tank 'Little Willie' never made it to war. Its first trial run was in September in Lincoln. Cars were unsuitable because they could not get across the very muddy ground. The first-ever tank design was called 'Little Willie' which weighed 18 tons and was designed to hold a crew of two plus four gunners. 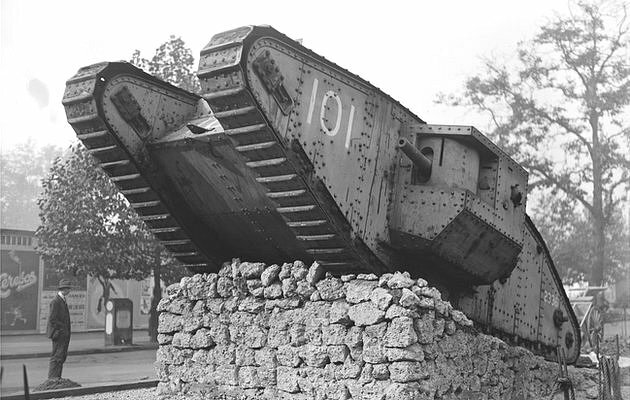 It was the first completed tank in history but it never went out to war. Tank design continued to develop and before the end of war a much better tank was was sent out to the front line for the first time. 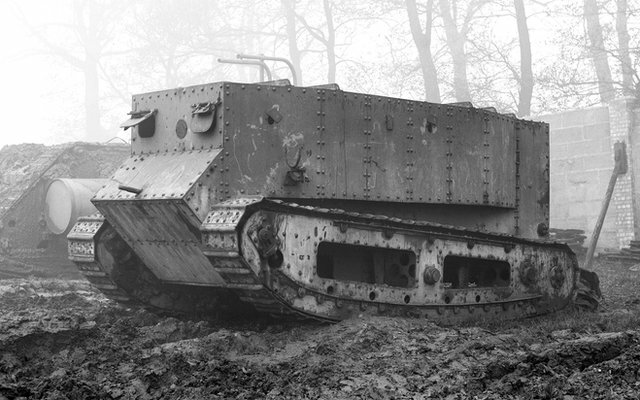 The British Mark I tank was used in September 1916. It could hold ten men and reached speeds of almost four miles per hour. 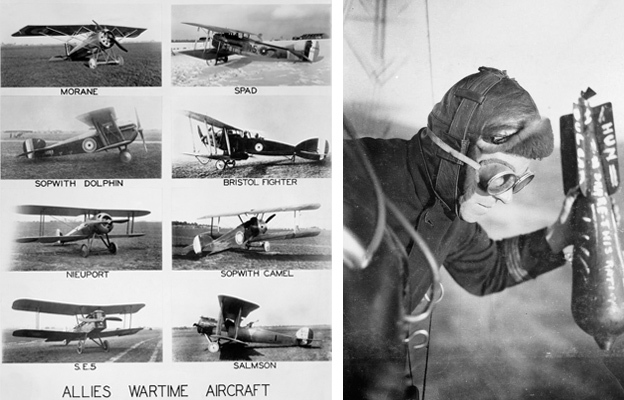 Planes were first used to observe the enemy and the pilot would report back to men on the ground. Allies' WW1 aircraft and a British airman dropping a bomb. Later, 'Scout' aircraft had machine guns to shoot down enemy planes. Bigger aircraft carried bombs to drop on troops on the ground. This was originally done by either the pilot or co-pilot dropping a bomb over the side of the plane (see photo). 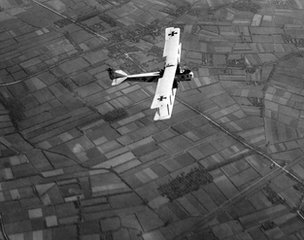 With the advancement in photography, planes were fitted with cameras, which took pictures of enemy positions for the Allies to use in plans for their next moves. 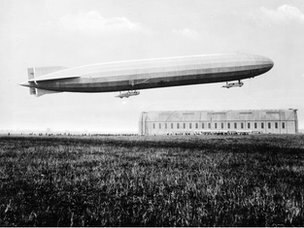 The German Zeppelin was a massive airship which weighed 12 tonnes and could get up to a speed of 136 miles per hour. It carried around 2,000 kilograms of bombs. Zeppelins carried out lots of raids on England and especially in London. However they were large and slow. This made them easy targets after the British worked out they could easily be shot and set on fire. The Germans eventually stopped using Zeppelins. 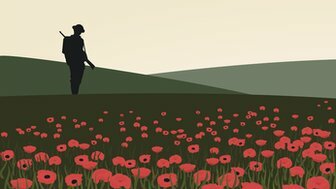 Teachers' notes and classroom ideas looking at technology, communications and weapons.